To achieve this in your Excel-DNA project there are several steps. The critical line is “parentWindow.AssignHandle(ExcelDna.Integration.ExcelDnaUtil.WindowHandle);”. 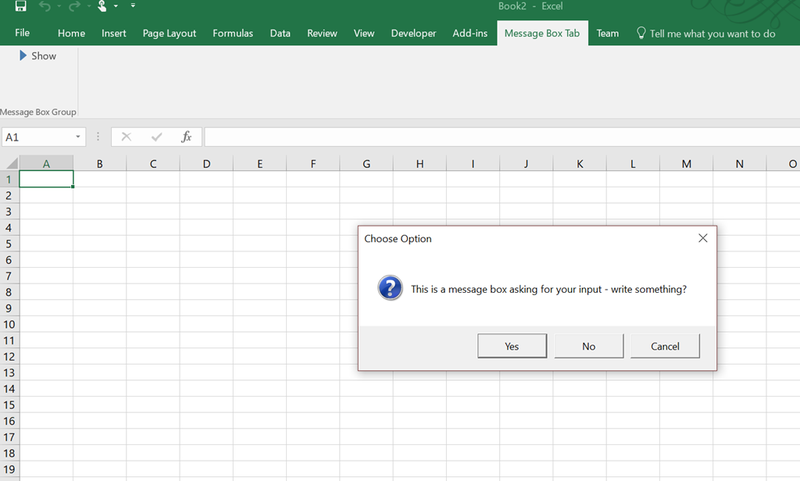 Here we use Excel-DNA to get a reference to the Excel window, and then use this to display a message box within the context of excel (as a child window). MessageBoxButtons contains the standard options, YesNo, OkCancel etc. There are some changes to how excel itself handles windows from versions 2013 onwards but I have tested before and after so should work in most Excel versions (though no guarantees). When calling message boxes from background threads things get a little tricky. 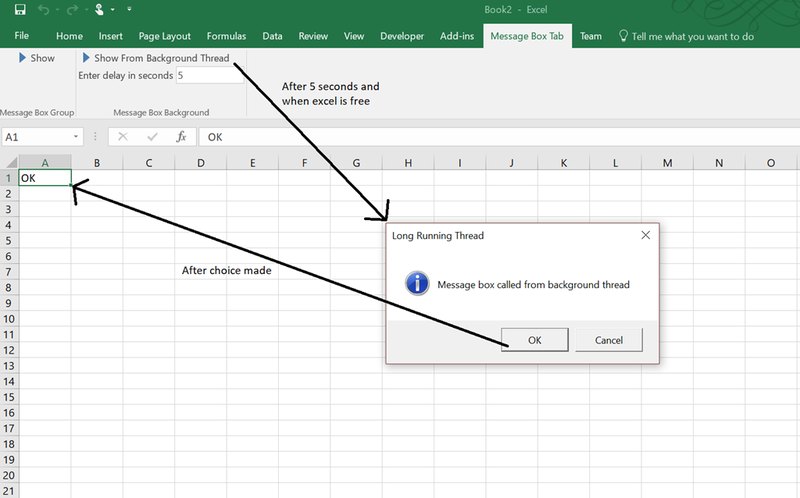 Excel is at heart a single threaded application, so any Excel COM interaction has to be passed back to the main thread. You’ll know when you’ve hit this problem if the focus returns to the wrong workbook after a message box is displayed, or there may be just a cryptic COM exception. Excel-DNA provides help with this, which is to use the function ExcelAsyncUtil.QueueAsMacro. This waits for the main thread to be free then runs the code that interacts with Excel, i.e if the user is editing a cell at the time the function is called, it will wait until editing is finished, and then and only then call the code. However, if we want to show a message box in this workflow we often want to wait for user feedback i.e. YesNo, OkCancel. the default method does not block execution so any code that uses a returned DialogResult will always use DialogResult.None. This means we need to do some more work with the provided function. /// Run a function using ExcelAsyncUtil.QueueAsMacro and allow waiting for the result. /// Waits until excel resources are free, runs the func, then waits for the func to complete. So what are we doing here? By using a TaskCompletionSource we can force completion of the function before continuing using ‘await tcs.Task’. This is turn means we can await the QueueAsMacroAsync function and do something with the MessageBox result. Welcome to my blog site, where I hope to bring bite-sized introductions to random topics I encounter on my coding journey. I'll mostly write about things that I struggled to understand from the wealth of existing blogs on the inter-m-web. Hopefully some of your minds work like mine, and you find this useful. *All code examples are sports based only because I get bored of reading about cooking, cakes, and flying ducks who can't quack.